The EFT Science and Research archive contains all scientific EFT research (abstracts and links) by topic, author, type of research and year published. It is updated periodically as new articles and studies are published. For quick reference, download a comprehensive, hierarchical, and chronological list (.pdf) of EFT Research courtesy of ACEP (The Association for Comprehensive Energy Psychology). Additional EFT science-related articles by other researchers, EFT practitioners or therapists, can be found in our EFT Articles Archive. Most articles are published in scientific journals. Some are free and others require a fee to access. Many scientific studies (see above) have validated the effectiveness of EFT and continue to shed light on the mechanisms that underlie the process. Additionally, the physical effects of tapping on the body and brain are being measured and documented, as are the psychological benefits. “It used to be ‘commonly known’ that the brain cannot change, and if neurons die, they cannot be replaced. What we know now is vastly more dynamic and points to where EFT can make a profound difference. After doctors proclaimed Pedro’s stroke to be permanently and severely debilitating. Bach-Y-Rita painstakingly got his father speaking and walking again, and his father went on to live a very full life; Pedro was still rock climbing when he died at age 72! Neurology hasn’t been the same since. Another example is Jill Bolte Taylor, a neuroscientist who had a stroke at 37 which could have left her greatly impaired – but she believed in neuroplasticity. She worked hard on her recovery and is a college professor, author of My Stroke of Insight. EFT helps us unlearn what we don’t enjoy about our feelings and behaviours, and more quickly learn to do and feel what we do enjoy. If there is an emotional component, EFT may help. Two terms that are critical to understanding how this happens is “extinguishing” and “reconsolidation”; you can learn a lot about this by reading Bruce Ecker’s Unlocking the Emotional Brain. If you prefer audio learning, then David Feinstein’s audio from his short talk on extinguishing and reconsolidation will soon be available as a link on this site. When we have thoughts, conscious or subconscious, we often have a feeling that goes with it; happiness comes with thoughts we consider happy, despair with thoughts we consider to induce despair, sadness comes with sad-making thoughts. We DO feelings, in our brains and our body. Feeling each feeling is its own skill. And just like any other habit, the more we do a thing, the more we think a thought, the more we feel a feeling, the better we are at it. When we are “good” at doing something, it means that we have a significant amount of brain real estate devoted to that something in terms of brain area and we have rich connections between neurons. Piano players have larger and denser body maps for their fingers, blind people have the areas otherwise devoted to sight taken up by other senses, and linguists have more real estate and neuron connection density devoted to language. People prone to panic attacks have a nervous system primed to react fearfully, and those evolutionarily ancient fear circuits are more robust, triggered by more perceptions and more easily. Interventions like cognitive behavioural therapy help people learn new and genuinely valuable skills that, the more someone practices, the better they can be at – for instance, calming down. However, the sensitivity underneath the new skills of soothing remain in potential, and can be re-expressed under certain circumstances. In short, the panic attack potential remains. This new learning as an overlay is called “extinction.” You can think of it as like water extinguishing a fire, but the combustible material can light up again later. Still sticking with the panic attack example, EFT can help someone soothe themselves in a moment. That gives them the experience of having the panic, and having things be OK too. By using that meridian stimulation, over time, something quite special happens – the underlying potential for the panic attack is unlearned. It is unwired from the body. New skills replacing an old set of skills is called ‘reconsolidation’. Not only is the fire put out, the flammable material is cleaned away. “Just like we used to think the brain was pretty fixed and stuck, we used to think the same thing about genes. Genes are the body’s way of telling us how to make necessary stuff like proteins, blood, new cells, etc. all necessary for life. Different ways of making the same thing, like hair in different colours or textures, are called alleles; they are simply different types of the same gene. 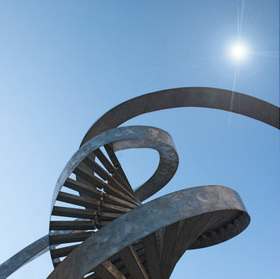 Watson and Crick (and their teams) were considered the first to discover the spiral staircase structure of DNA, called a helix, made up of a small number of proteins that came in predictable pairs. Many thought we were on the verge of wiping out not only genetic diseases like Huntington’s Syndrome, we also thought we had found the ‘Lego set’ of nature – we could build anything. Genetic companies sprang up like a biological Silicon Valley – and just like there, most went bust. Why? Because the promise of, “we can find this gene that will always do that one thing,” simply wasn’t true. Dr. Bruce Lipton, who wrote an engaging book called, The Biology of Belief, was a pioneer in the seemingly small territory of petri dishes. He found that DNA would behave differently in different environments. The teensiest nutshell of epigenetics is that the environment – which includes the internal chemistry of your body – can turn genes off and on. Genes can be regulated without medicine; we do it all the time, every minute. Our internal biological environment, deeply influenced by what happens outside of our bodies, is gene regulation. This turned out to be so extensive, in fact, that if someone feels sad for even a few minutes, they will supress the functioning of their immune system by activating the genes that disable the immune system and inactivating the ones that strengthen it. Conversely, feeling the more pleasant side of feelings, like happiness, for even a few minutes, goes the other way around. Feeling happy turns on the genes that strengthen your immune system, and switches off the genes that weaken it. Just like our brain, our internal environment is constantly shifting and changing, and our intentions map a path for our biology to follow. “When we get stressed, we have had thoughts telling us we are in, right now, or about to be in, danger. This isn’t just about ancient circuits making us go into flight or fight when seeing a predator. Like horses and dogs, we are social creatures, and social dangers like rejection and even disapproval can, just like spotting a puma dangerously close by, can set off the same fear circuits inside of us. Stress is a summary for a body state that is primed to accommodate survival. Stress experienced as something we can handle will result in fight or flight being triggered – that’s the part of the autonomic nervous system called the sympathetic nervous system. This is action priming, experienced as raised heart rate, suppression of immune system and digestion, suppression of the detoxification function of the liver and kidneys, and getting rid of weight to enable higher speeds (soiling or wetting one’s underwear – guess that worked better when we didn’t wear clothes). Also, eraction times that go through our more recently evolved brain area, the neocortex, simply goes offline. We literally can’t think properly as our intellect and reason has been pretty much switched off. Stress – danger – that we are not sure if we can handle results in the freeze response – like pressing down on the accelerator (sympathetic system) and the brakes (parasympathetic) at the same time. You have seen this in the taut muscles of a deer caught in headlights. It is a state of being frozen in terror. There is a deeper state, brought on by what is called Inescapable Stimuli (IS). This is the deepest stress of all. When we can’t run, and we can’t fight our way out, and we learn or surmise that no matter what we do we cannot escape, another part of our nervous system takes over. We shut down; the Vagal Nerve System has taken over – you can read about this in detail in any book by Stephen Porges or catch some of his full YouTube videos. This is a state of flop, of collapse. It is useful to have the biological capacity for this collapse because the chewing and tearing of some predators are triggered by the thrashing of the prey – if one were to stop fighting, then it could increase chances of survival, and stress means survival of the physical organism is at the top of the biological agenda. This is Fight/Flight/Freeze/Flop – our bodies in distress. “Cutting-edge trauma research is indicating that body-based interventions are necessary for lasting change and meridian stimulation is a very effective somatic intervention. The single article that most changed American energy psychology (EP) history is David Feinstein’s meta-analysis of the energy psychology efficacy literature, published in 2012. Before this article was written, the American Psychological Association (APA) was vociferously against all forms of energy psychology, and had stated that it would not even support research in the area. When this study came out, with the advocacy of senior EP practitioners in the US, the APA did a complete 180. David’s article convinced them not only that research was valuable and desirable; the APA now accepts continuing education credits from some carefully vetted EP courses run by ACEP and in their annual conference. The take-away point from David’s article is that EP research indicates that meridian-based interventions are at least as good as conventional treatments, if not better, at relieving particularly post-traumatic stress, anxiety and other stresses and their related issues such as phobias. EP has attained what is the highest level of proof in the treatment of mental health: ‘probably efficacious’. Although the term ‘probably efficacious’ can seem wishy washy to people not familiar with the jargon, there is no higher category to attain in the APA system. “This new branch of science has emerged in the last 35 years. It is the study of how psychological processes (our thoughts and emotions) affect the nervous and immune systems of the human body. The late Dr. Candace Pert who made groundbreaking discoveries concerning the way the emotions act directly upon the immune system through neuropeptide-specific receptors, was another scientist who advocated EFT. “Have you ever heard of acupuncture? This is an established way of treating just about any disorder as well as contributing to the maintenance of optimal health. It uses 14 meridians and channels that used to be considered speculative.